Prophet Dawood was the King of his people. He had 19 sons, each one of them hoped to inherit the father's throne. 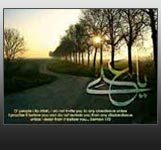 Allah revealed to Prophet Dawood a few questions and their answers and commanded him to put those questions to each one of his sons. Whosoever answered those questions correctly, would inherit his throne. The action - the end of which is bad is haste at the time of anger. Prophet Dawood obviously, was very much impressed with his knowledge and appointed Prophet Sulaiman as his successor. Thus it will be seen that it was the supreme knowledge and wisdom that made Prophet Sulaiman succeed his father and become the Great King Prophet.